As I have explained in the introductory of Life’s Celebrations, ritual follows a prescribed process (Rites of Passage Workbook). The reason for repeating a ritual in the same manner is so that, over time, a continuous stream of mindfulness and spiritual connection is built up. 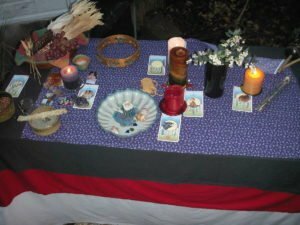 Ritual can be a spiritual practice, not just a foundation for ceremony. I grew up in the 50’s and 60’s raised in the Catholic Church. At that time, the religious service (the Mass) was conducted in Latin, and prescribed clothing was worn. Every Mass is a ritual practice. 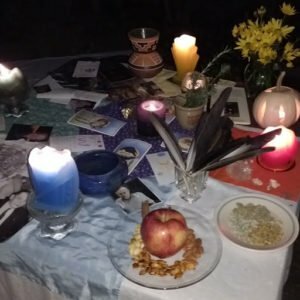 I felt a strong connection to the ritual aspects from a very young age, and less and less to the content as I grew up. I left the Catholic Church when I married and left home. My life took me on a journey through several forms of religion and philosophy. As a young person growing up in southern California, I was also drawn to the indigenous cultures of the Southwest. My mother carried an interest in native cultures as well. I have traveled extensively throughout the Southwest, experiencing the land and sacred native homes. Their spirituality incorporates strong ritual practices. Combining a deep relationship with ritual, years of meditation on the Tarot and Astrology and research into many indigenous spiritual practices, I have developed a spiritual practice of my own creation. I continue the meditations and research and have also created specific rituals according to the four phases of the moon and the eight solar festivals through the year. The new moon, the waxing and waning quarter moons, and the full moon are opportunities for women to enter into the feminine mysteries because of our ancient and intimate relationship with the moon and its phases. There are usually thirteen moons in a calendar or solar year. The solar opportunities occur on the equinoxes and solstices along with the four Gaelic midpoint festivals. The New Year begins with the close of the Winter Solstice, followed by Candlemas, then the Spring Equinox, May Day, the Summer Solstice, Lammas, the Autumn Equinox and lastly Summer’s End, which reaches through All Hallows to the Winter Solstice. Consequently, there are two festivals in each of the four seasons. One of the reasons for sharing my spiritual practice comes out of a desire to build community. The ritual work I do in my practice involves calling a circle. Those who choose to experience the circle are free to witness or participate to the extent that is comfortable for them. I hold the circle in a gentle respectful way. Interested In Celebrating Our Human Spiritual Connections To Nature, Our Ancestors, & The Cosmos?